Spring is upon us. The pollen count is going up, the clocks have sprung forward and this can only mean that festival season is right around the corner. One of the first festivals of the year is Suwannee Springfest. 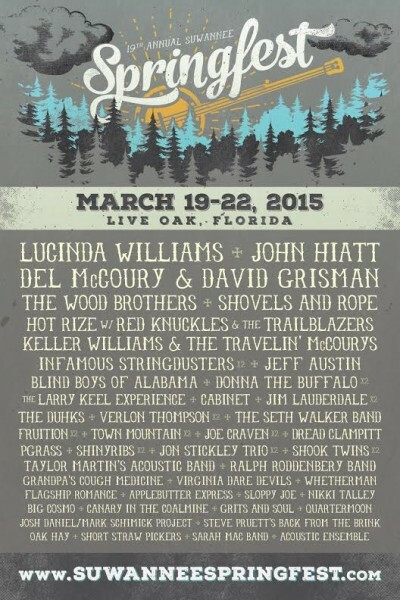 Held at the Sprit of the Suwannee Music Park in Live Oak, Fla. on March 19-22, the event hosts some of the best in bluegrass and Americana music. Acts this year include John Hiatt, Lucinda Williams, The Infamous Stringdusters, Donna the Buffalo, The Larry Keel Experience, Shovels & Rope and many more. But another draw of the festival is the park itself. Sitting on close to 600 acres on the banks of the Suwannee River, with its tea-colored water the park is littered with live oaks draped in Spanish moss. There are also horse stables, lakes and hiking trails to occupy down time. The first festival was held on the site in 1986 when Bob and Jean Cornett held the Spirit of the Suwannee Bluegrass Festival. 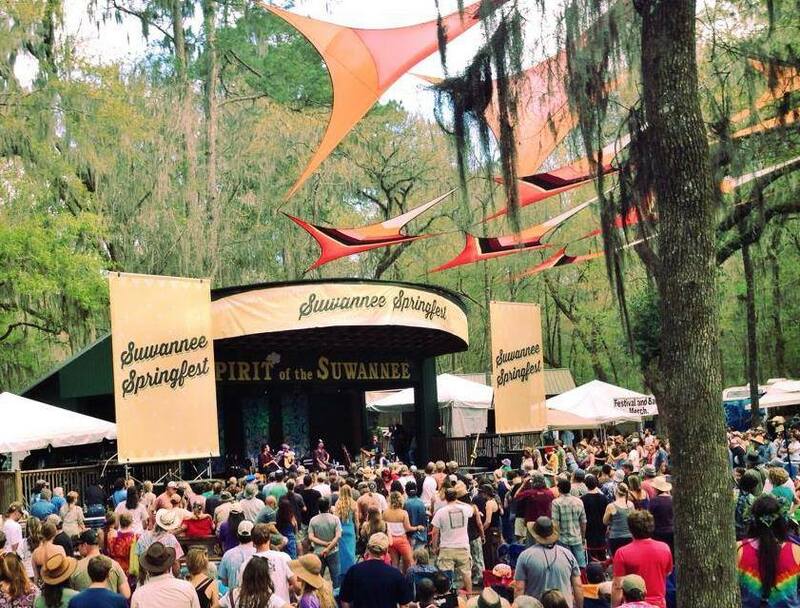 Multiple events are held in the park every year including Wanee, Magnoliafest, Aura and Hulaween. Bluegrass has been integral to the Live Oak area ever since the 1950s. Even though the festivals at the park are a far cry from the first Suwannee River Jamboree that was held in a local high school auditorium, the Jamboree was the reason Dr. Ralph Stanley, his brother Carter and the Clinch Mountain Boys relocated to Live Oak. Having the Stanley Brothers as locals led to the Jamboree booking national acts like Bill Monroe and Ernest Tubb. Suwannee County built the park in 1979, but by 1984 was ready to sell the property. The Cornetts stepped in and regular festivals were started. In 1996, Randy and Beth Judy launched MagnoliaFest and Springfest and both have been held every year since. This year will mark the 19th Springfest and Nevins has been there for each one. Van Zant, widow of Lynryd Skynyrd’s Ronnie Van Zant, took over management of Springfest and Magnoliafest in 2012 and has continued to book high-quality acts as well as supporting the up-and-comers. Donna the Buffalo has been called the ‘Beans and Rice of the festival’ and plays two sets each year including the traditional festival closer, where any musicians who remain onsite are invited out for a group jam.“We’ve had so many special moments in those jams,” Nevis said. Those jams in the campground are really what got Lyndsay Pruett up on stage. The 31-year-old fiddler, who is playing this year with both Jon Stickley Trio and Taylor Martin’s Acoustic Band, started going to the park when she was 16 years old. Her entire immediate family is involved with the park in some capacity. Her mother, Debbie, oversees the volunteers at the park as well as serving as Van Zant’s right-hand woman. Her sister, Samantha, is in charge of artist hospitality while her father, Steve, is a musician who plays with his band, Back From the Brink. As a young woman though, Lyndsay wanted a little separation. Stickley goes for tradition. “Right over by the Bill Monroe Memorial,” he says. “That’s where the jams are! They have a Bill Monroe memorial – how cool is that?” Sunday night means Hopryland, a site set up around a beer truck, where the artists gather to jam and bid farewell to the festival after everything is said and done. When asked to describe the festival site, the words “magical”, “spiritual”, “enchanting” and “beautiful” are repeated by performers. Pruett agrees and says the moss and swamp lead to a special feeling.